Slows down certain eye ailments which causes blurred or loss of vision. We simply cannot get the recommended daily value of vitamin D from most foods. The easiest way to get your recommended daily value of vitamin D3 from food will be to eat 4oz - 6oz of salmon every single day. The question now is: would you rather eat salmon every single day or take one tiny pill? Besides comfort, it just makes health and economic sense to choose the Just Potent Vitamin D3. Why Just Potent Vitamin D3? At Just Potent, we take great pride in formulating only the best supplements. The Just Potent name came about with that in mind; providing potent supplements without all the unnecessary added ingredients. 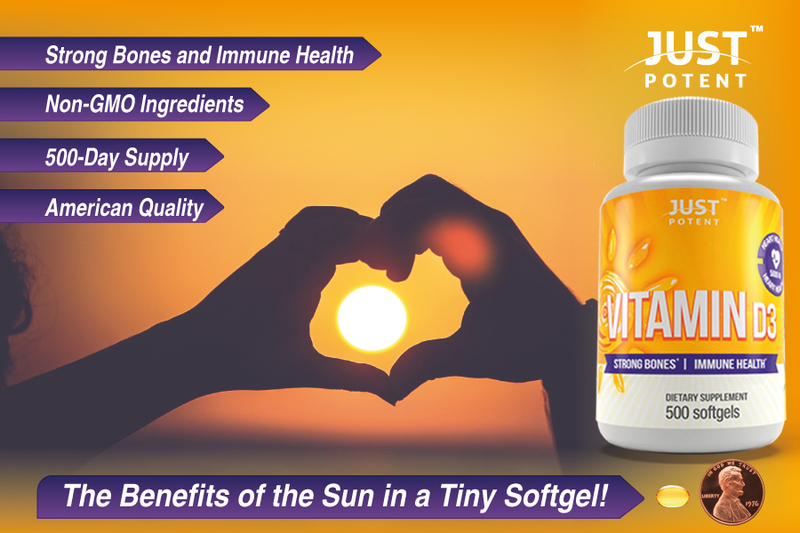 When you choose Just Potent Vitamin D3, you get nothing but the best vitamin D3 there is. The Just Potent Vitamin D3 delivers the same active vitamin D3 your body produces from exposure to the sun, without the risks that sun exposure may have on your skin. Although many believe they may be getting sufficient amount of D3 from the sun, studies have shown most people are not getting the recommended amount. Studies have also shown that the average amount of time we spend outside the house has decreased dramatically as we are staying indoors more than ever before. The Just Potent Vitamin D3 is a tiny softgel, when taken daily, will provide you with all the D3 your body needs. With 500 softgels, you’re are looking at 500 days of uninterrupted supply of vitamin D to your body with ABSOLUTELY no side effects. Do not exceed recommended serving size. Keep out of reach of children. Store in a cool, dry place. Do not use if the safety seal is broken or damaged. Not intended for use by pregnant or nursing women. If you're taking any medication or planning any medical procedure, consult your doctor before use. Discontinue use and consult your doctor if any adverse reactions occur. Adults, take one (1) softgel daily with meal or as directed by a healthcare professional. Be the first to know about the newest products launched and all promotions. Join our email list today! *These statements have not been evaluated by the food and drug administration. This product is not intended to treat, cure, or prevent any disease.